Tungsten is extremely hard and dense. Combined with carbon and other elements, it becomes tungsten carbide, which registers between 8-9 on the Mohs hardness scale. Tungsten carbide jewelry is composed of a metal alloy, tungsten carbide. The alloy allows for maximum hardness and rigidity without sacrificing tensile strength. Tungsten jewelry’s roughly 10 times harder than 18k gold and four times harder than titanium. In addition to tungsten carbide jewelry’s design and high polish, part of its attraction to consumers is its technical nature.Hardness, assuring long lasting beauty. Permanently polished tungsten jewelry, tungsten carbide rings, tungsten rings take a brilliant high polish and resist scratching longer than any metal ever offered to the public. Tungsten carbide jewelry will never bend out of shape. Tungsten Jewelry,tungsten carbide rings are making a revolution in the jewelry industry by introducing unique types of designs. Each tungsten carbide jewelry including tungsten carbide rings, tungsten rings which is cut and polished with diamond tools. Tungsten jewelry is not sizable by ordinary jewelers' tools -- the metal is too hard. Most tungsten carbide jewelry,tungsten carbide rings, tungsten rings metal powder is converted to tungsten carbide by reaction with pure carbon powder, e.g. carbon black, at 900 - 2200°C in pusher or batch furnaces, a process called carburisation. 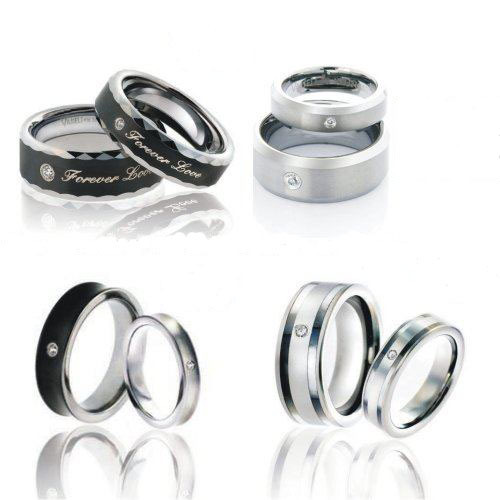 Tungsten jewelry includs tungsten carbide rings, tungsten rings,gold plated tungsten rings, tungsten wedding bands, tungsten earrings, tungsten necklaces,tungsten chains, tungsten bracelets, tungsten watches, ect. For people with sensitive skin tungsten carbide is the perfect jewelry metal. Many people are allergic to gold, silver, or platinum, or more commonly zinc or nickel, which are used as alloys in most jewelry. You don’t have to worry about this with tungsten carbide jewelry, tungsten carbide rings, tungsten rings,because tungsten stainless steel jewelry is hypoallergenic. This means that you will no longer have to deal with rashes and discolored skin from wearing your tungsten carbide jewelry. You can find more information about tungsten products on Tungsten Alloy. If you have any interest in the product, please feel free to email us: sales@chinatungsten.com or call us by: 0086 592 512 9696, 0086 592 512 9595. We are at your service.